It was the great Anko Itosu (1830 -1915) who developed the Pinan or Heian katas. Itosu was born in Yamagawa village, which was situated in the Shuri Region of Okinawa. Itosu began his study of Karate in 1846 under the legendary Sokon Matsumura (1809 - 1901). In Gichin Funakoshi's book, 'Karate-do Nyumon' master Itosu is described as being of average height with a huge chest that gave him 'the silhouette of a barrel.' Funakoshi goes on to say that despite Itosu's long flowing beard he had the face of an innocent child. It is said that Itosu possessed great physical strength and in particular his grip was said to be so powerful that he could crush green bamboo stalks with his bare hands! In 'Karate-Do - my way of life' Gichin Funakoshi tells us that Itosu was once awoken from his sleep by some suspicious noises coming from the gate of his house. Itosu moved quietly towards the gate and realised that someone was attempting to pick the lock. Itosu punched a hole in the door, reached through and used his strong grip to restrain the would-be thief. Aside from Itosu's physical strength and striking power it is said that he could withstand the strongest of blows. Gichin Funakoshi also tells a tale of when Itosu was attacked as he was entering a restaurant in Naha. A strong young man sneaked up on Itosu and punched him as hard as he could. Itosu tensed his muscles and the blow had no effect. Itosu grabbed the wrist of his attacker and, without looking at his face, dragged him inside the restaurant. Itosu ordered the waitress to bring food & wine; he took a sip of the wine and then looked at the young man for the first time. Itosu smiled and told the now terrified young man that he did not recognise him, and had no idea what grudge he may hold against Itosu, but perhaps they could sit down and have a drink together. Itosu was an well-educated man and worked as a scribe to Shotai, the last king of the Ryu Kyu islands, until the monarchy was dissolved in 1879. In 1901, Itosu placed Karate onto the physical education program of the Shuri Jinjo elementary school. As it stood Itosu believed Karate to be too dangerous to be taught to children and set about disguising the more dangerous techniques contained within the katas. As a result of these modifications, the children were taught the katas as mostly blocking & punching. This enabled the children to gain benefits such as improved health and discipline from their karate practice without giving them knowledge of the highly effective & dangerous fighting techniques that the katas contain. In 1905, Itosu was appointed as karate teacher to the Prefectural Dai Ichi Collage and the Prefectural teachers' training collage. In 1908 Itosu wrote a letter to the Prefectural education department that outlined his views on karate and asked that karate be introduced onto the curriculum of all Okinawan schools. Itosu was granted his wish and karate became part of the education of all Okinawan children. Itosu died in 1915, aged 85. The Pinan katas are often thought of as training methods for beginners or children and are hence undervalued by more experienced karateka. The main reason for the katas being viewed this way is the fact that they were first established at the time Itosu was introducing Karate to the Okinawan schools. Some say that the Pinans are mealy watered down versions of the advanced kata and were developed solely for children. If this were the case then why did Itosu also teach the Pinans to his adult students? It is far more likely that Itosu had developed the Pinans over a period of time and meant for them to be a synthesis of the best methods being practised in the Shuri region. When karate was introduced to the Okinawan schools the Pinans would be the natural choice because they are relatively short. This is probably the only reason they were selected and has nothing to do with the effectiveness of techniques contained within them. The main difference between the adults and children's training would simply be a matter of approach, as opposed to any change in subject matter. As mentioned earlier, the children would be taught the katas as 'block and punch' whereas the adults would receive instruction in all the methods contained within the katas including throws, chokes, strangles, joint locks, hair pulling, gouging methods etc. One of the problems with karate today is that it is the children's applications that are most commonly practised. This has lead to the majority of karateka practising the art as a rather limited striking system as opposed to the complete fighting system it was intended to be (see the book & videos of further details). Of the four major Japanese styles of karate (Shotokan, Wado-Ryu, Goju-Ryu, & Shito-Ryu) practised throughout the world today only Goju-Ryu does not practice the Pinan / Heian Katas. The reason the Pinan katas are common to the three remaining styles is that Itosu features strongly their family trees. Master Itosu along with Kanryo Higaonna were the main teachers of Kenwa Mabuni (founder of Shito-Ryu). The name 'Shito' is derived from the two characters used in the writing of Itosu& 'Higaonna'. Mabuni was undoubtedly Itosu's foremost disciple. Along with Master Azato & Master Matumura, Itosu was also one of the teachers of Gichin Funakoshi (founder of Shotokan). It is doubtful that Funakoshi learnt the Pinans directly from Itosu as Funakoshi concluded his training with Itosu before the Pinans came into being. Some sources say that Funakoshi learnt the Pinan katas from Kenwa Mabuni in 1919, four years after Itosu's death. Kenwa Mabuni, Gichin Funakoshi & Choki Motobu (who also studied under Itosu) were the main karate teachers of Hironori Otsuka (founder of Wado-Ryu). Otsuka also studied Shinto Yoshin Ryu jujitsu under Yukiyoshi Tatasusaburo Nakayama. Otsuka received his instruction in the Pinan katas from both Mabuni and Funakoshi. The word 'Pinan' means 'peaceful mind' (Note: same characters can also be read as "Safe form Harm" in Chinese). The name is taken to mean that once these five forms and their applications have been mastered the karateka can be confident in their ability to defend themselves in most situations. The word 'Pinan' is made up two ideograms. The original Okinawan pronunciation of the first ideogram is 'pin', whereas the Japanese pronounce it 'hei.' Generally Wado-Ryu & Shito-Ryu favour the Okinawan pronunciation of 'Pinan'. Shotokan stylists favour the Japanese pronunciation of 'Heian.' The reason for this is that Gichin Funakoshi gave all the katas practised within Shotokan Japanese names. He did this so that the Japanese people would find the names easier to use, to further distance the art from any of its Chinese origins and to acknowledge the development of karate by the Okinawans & Japanese. Gichin Funakoshi also swapped the 'Nidan' (2nd level) & 'Shodan' (1st level) suffixes so that the names reflected the order in which the katas are most commonly taught. 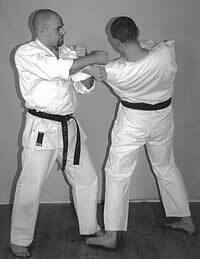 This means that Shotokan's 'Heian Shodan' is called "Pinan Nidan" in the remaining styles and vice-versa. There are differences in the ways that the various styles perform the Pinan / Heian katas but the overall pattern remains the same. These changes are the result of the developments made by the founders of each style. There are also minor variations between many of the instructors and associations that are in existence today. There is nothing automatically wrong with these variations. Variations due to forgetfulness, insufficient study, poor technique, laziness etc. are obviously undesirable but this does not mean that all variations are unacceptable. Every one of us is different and hence it is impossible for everybody to perform the katas in exactly the same way. Subtle changes over time are, to my mind, actually desirable as it is in this way that karate continues to evolve. When analysed correctly the Pinans / Heians have a great deal to offer to the karateka. Itosu was an extremely talented fighter and the Pinans / Heians are regarded by many to be a summary of his most effective methods - A fact supported by the name he chose for them. We are greatly indebted to Itosu for creating such an effective system of fighting.